I am posting two articles about the use of isolation rooms as a form of discipline in schools. I have spoken to various teachers and parents the past few days who have confirmed that these rooms are still used in Washington state schools, including some in the Seattle metro region. With the growing public outcry over racial disparities in school discipline, and the growing emphasis on positive forms of behavioral intervention, we should question and challenge the use of these isolation techniques in our schools. I am particularly interested in hearing perspectives from special education teachers, students who have been subjected to these forms of discipline, and parents of students in special education programs. If you have experiences with this, and would like to share your thoughts on it, please comment below or contact me at mamosrotnelli AT gmail.com. In some Northwest schools, if a child has an “outburst”, they may be put forcibly in a device called an “isolation booth” or “isolation room” where they are left for some portion of the school day. In Longview, Washington it is a free standing 4’ x 4’ padded, pink-walled, empty room with ceiling ventilation, an observation window, an outside lock, and, presumably, a monitor. A student from first grade on may be judged as problematic, removed forcibly in front of other students, and locked inside “the naughty room”, the students’ term. In Oregon, after a shocked parent complained this past year, the state legislature in February unanimously passed House Bill 2576 with follow-up passage of the Senate version. This requires that there be no purchasing, building or use of a free-standing isolation booth in public schools. A Portland elementary school, within months, went around the bill creating a “room” instead of a “booth” by using an already standing wall of the school. It is available for use. 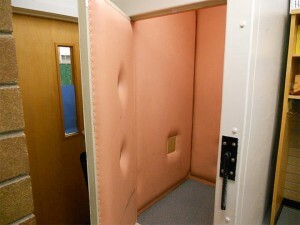 In Washington, where the practice was brought to the attention by the news media, the “isolation booth” was reputed by the school to be used for only special education students whose parents had given permission. A parent shocked to learn about her own student’s detention in this cell while they together watched a news program that showed the unit, came forth with the assertion that she never had, and never would have given such permission. It appears no audit has yet been done by the states. Therapeutic isolation is supposedly a technique abandoned by the psychiatric field decades ago, and one psychiatrist testified against it in the Oregon Legislature leaving the schools, you would think, with the task of proving their value. Some schools contend they served disabled students especially in the “autism spectrum”, but there has not surfaced the scientific data needed to show the efficacy of such a protocol. One student reported observing a fellow student go in relatively calm, and later turn violent while locked inside. Certainly this is dangeroulsy traumatizing to the student body witnessing these procedures for some years now. Some of the cells have even been within some classrooms. Young people must come away with the inevitable belief that they may do something that will put them in one of these horrific lock-ups. The element of fear increases the daily stress involved in learning subjects a student may find naturally difficult or there may be stress added when managing racially charged situations traditionally not in their favor. The fact that there are students who have not discussed this with their parents up until now is especially concerning. What other practices are hidden from parents? There are no actual complete figures on how many schools use this procedure, but so far enough schools have been forthcoming to show that with eight Oregon School districts reporting, children have been put in a seclusion room 791 times in the past school year. Their data do not distinguish between a “booth” or a “room”. Certainly there are children with special needs whose control of themselves is not going to be adequate for the average classroom. These are children for whom there needs to be a much different situation, but it must be proven at the very least that their isolation in this severe manner away from home and the guidance of their health care professionals is harmless. All parents need to know their child may have been traumatized simply by witnessing the procedure and the schools need to address that harm as well as the possible harm done to the subjects of isolation. This jump to a punitive, not a harmonious, means to control the student body is in alignment with the growing list of other trends in the nation’s school system: metal detectors at entrances, uniformed police,‘resource officers’ who wear guns, tasers and cuffs in the halls, dogs for ‘sniffing’ and patrolling, warrantless searches, and school suspension rules with sentences expanded to so many days that catching up is impossible, failure insurance. Truancy courts themselves are an along-the-way invention replacing the school principal’s role as the arbiter of situations that used to be called a “ruckus”. Perhaps the surveillance cameras that students are under in school should be used to live-stream the classrooms to public television channels so parents may watch the conditions under which their children are being educated. Unfortunately, all these practices brought over from law enforcement and the judicial and prison systems groom the young for a dominated existence instead of deepening an understanding of democracy. This second article discusses the use of isolation – based discipline in Oregon schools; the author argues that schools are continuing this practice in new forms after public outrage lead to a state law banning isolation booths. The author’s conclusion at the end of the article is inadequate though – not everyone can afford to homeschool or send their kids to private school. We also need to organize inside the public schools to change this sort of thing. Categories Ableism, Commentary, Mass Incarceration, What's happening in Seattle? Reblogged this on Free UniversE-ity. Once again this great system we live in is blinding the parents of our youth I’m 33 years old and when I was in first grade at st Helens elementary in long view Washington I subjected to what we as the kids called the pink room. I was not a special needs kid I was thrown in it for not reading out loud I was told for only 10min but she said she did 20 cause I needed extra time to think of what I did! inside it is torture and in humane I’m astonished they still use them! Since then I’m still not comfortable in enclosed areas all that is doing is screwing children up mentally and emotionally! Parents might as well throw there children in a jail cell! it makes me so angry to hear that you had to go through that! When we’ve talked about this issue with parents in Seattle many have been surprised and outraged the schools didn’t tell them this was happening. My 5yr old grandson, was put in the isolation room, almost daily, for the first month of kindergarten. He was once put in there for having a pencil, and once for having some change. His teacher thought he might have stolen it, eventhough. nothing was reported missing. He was never put in there when the substitute was there, and I asked her, what she did differently, and she said, “I don’t have a problem with him.” They would call us to come get him, and he would still be catching his breath, an hour later. He was afraid to go from one end of the house to the other, by himself. They got our permission, by leading us to believe he was being put in time-out, in an adjacent classroom. We’d never even heard of them having an isolation room.